Black Panther, produced under the banner of Marvel Studios, became one of the top-grossing movies of Hollywood in 2018. A superhero movie that combines movie-making excellence, brilliant acting, and a gripping storyline, all of which makes it well-deserved. Oops! But let’s not talk about the movie! Let us keep that for some other time. Today, let’s focus on the customers and their journey. I decided to watch the movie after reading the reviews and ratings, watching the trailer and in the end, depending much on audience feedback. I did not travel, yet, I was moving. Confused? Couldn’t understand the reference? Well, I wasn’t moving physically, but figuratively, I was on a journey. This journey which is often called the customer journey. The path that determined a journey from reading the reviews to watching the movie. Hence, customer journey is the path taken by customers before making a purchase decision. Customer journey maps depict the journey undertaken by the customer visually. This quote from Warren Buffet highlights how responsible the marketing team in business should remain to build a reputation along the customer journey. You don’t just get customers. You also earn their loyalty, trustworthiness, goodwill, and reliability which furthers your brand name. Building a customer journey is an essential aspect for all businesses. Now, there are two adjacent terms in marketing that deal with a similar concept of customers but have very different meanings. The Customer journey is the path that determines a customer’s decision to purchase an item. For instance, you don’t immediately buy a product/service when you see it. You first go through the reviews, and feedbacks of the previous customers. Once you get enough positive feedbacks, you decide to purchase it. Customer experience is the interaction that a customer conducts with a business relating to its products and/or services. Customer experience is the customer’s perception of the company. Customer perception is an irreplaceable and valuable asset. Anything that a business does adds to a customer’s opinion. It determines the future sales and response of your business campaigns. Customers are getting frustrated with the level of service they experience. 91% of customers have to contact a company several times for the same reason, whereas 90% of them are put on hold for a long time. 89% of the customers have further highlighted that they have to repeat their issue to different representatives (Accenture Global Consumer Pulse Survey). Customer Journey Map: What does it contain? Lens: Lens is used to view the summary of a buyer’s persona. It is essential because customers have multiple touchpoints, different paths, and different personas. The lens helps you chart out multiple personas that revolve around the same core customer experience. Journey model: The journey model shows the data modeling of the customer journey step-by-step, in phases and channels. It shows where the customer breaks their experience, where they neglect the product and so on. This model shows the transition of channels of customer experience in the customer journey. Qualitative insights: Qualitative insights help you understand the importance and value of the particular touchpoint for the different customers. Quantitative information: Quantitative information shows the relevancy and usefulness of the customer survey and reports. It emphasizes in details about the specific parts of the customer journey. It can be the enjoyment level of each phase, traffic, usage level and so on. It shows how much channel switching occurs at a particular point in time. Takeaways: Takeaways build the next phase of the customer journey. They identify the opportunities, pain points, and call-to-action. Takeaways depend on tactical design and strategy. Net Promoter Score: It predicts business growth and also measures customer experience. Customer Satisfaction: Customer Satisfaction is a survey that helps to measure your customer’s satisfaction before, after and during the support services are provided. Customer satisfaction depends on agents of productivity, ticket deflection strategy, and self-service experience. Customer Effort Score: It measures the effectivity of the customer’s self-service. Customer Effect Score measures the ease with which customers can register, activate and solve product issues on their own. It also calculates the time customers spend accessing their information. Retention rate: Retention rate is the percentage of customers that a company has retained over a particular period. It indicates the portion of the customers the company has lost during a specified period. This measurement can identify the number of customers you have lost on the customer journey. Ticket Distribution and Volume by support: These explain the content gaps that relate to volume-generating issues and sticking points. Bounce rates and Pages per session: Bounce rates are the indicators that measure the immediate exit of customers after viewing the first page. Pages per session measure the time spent on a web page. Customer success: Customer success explains the continuing efforts of the organization to deliver value to the customers. A good customer success program must provide a positive value during every stage of the customer journey. Upsell and Cross-sell rate: Upsell rate refers to the offer that is more beneficial to the company like selling a more expensive product. Cross-selling is an item that is related to the original desired article. The rate of adoption: Rate of adoption is the measure that indicates the number of customers successfully using your product to achieve their business goals. It leads to high retention rates and revenue growth. Knowing your active customers is the base to measure the speed of adoption. Customer health score: It is the metric based on the customer’s usage of the product. It tracks the last login time, average log in times, the average number of online bookings, the name of the text and email reminders generated and so on. Customer retention costs: These are the continuing cost of technical support and other resources to maintain customer usage and their engagement. 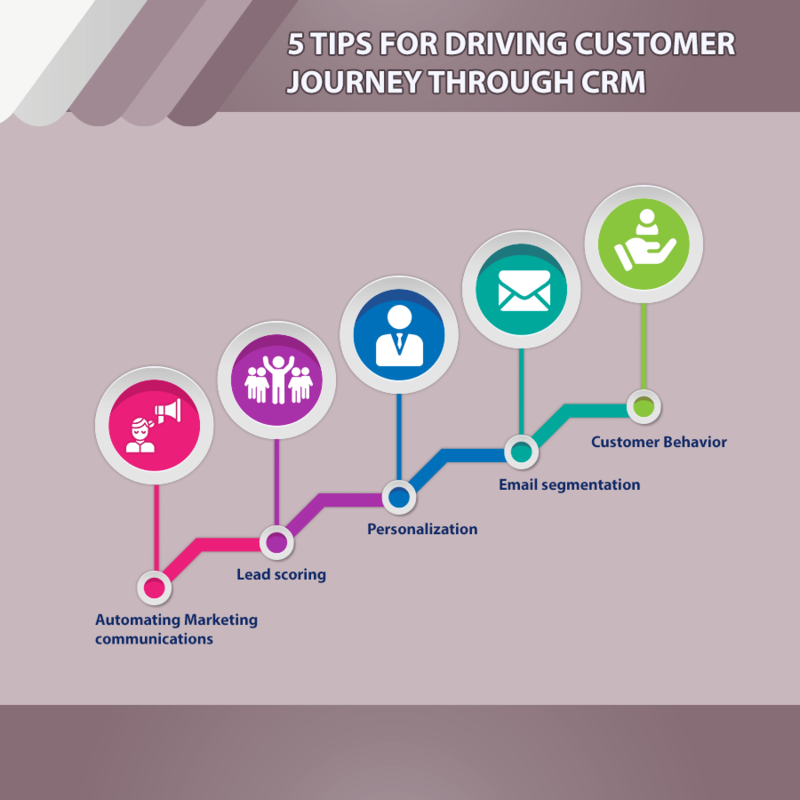 A quality CRM tool can help you monitor, classify and manage the customer journey. 67% of the buyer’s journey is now done digitally. (SiriusDecisions). What are Touchpoints and Channels? Touchpoints are a customer’s point of contact with the product/service of a business. It is defined as any time in which the customer comes in contact with your brand. It can be before or after purchasing the same. Identifying your touchpoints is the first step for drawing customer journey map. The best example is the online review of the product. A channel is where the customer interaction with the brand takes place. It might be through media, mail, online or even in a physical store. 83% of consumers require some degree of customer support while making an online purchase (eConsultancy). Branded touchpoints:You must list, outline and identify all the branded touchpoints. To be more explicit, you must create or design a list. The list must provide different ways a customer can interact with your brand. A specific list will have more details and clarity in it. Target customer persona: Your marketing team must have a consistent point of reference throughout the process of journey mapping. Having a buyer’s persona will allow your brand to reach out to the right customers. Customer goals: You must know what your customers are willing to gain from each touchpoint or brand interaction. You must review the touchpoints created at the beginning along with the outlines. After reviewing these, you must brainstorm the reasons why your buyer persona would interact with your brand. Visualize interactions: You must match the target customer persona with the desired goal or outcome. This is the stage where the customer journey comes to play. The ultimate goal of the customer journey is purchase. Beyond purchase, it is all about nurturing loyalty and building lasting relationships. Interaction frequency: In this step, you analyze the interaction frequency of the customers when purchasing at various touchpoints. The goal here is to enhance the overall flow between the multiple touchpoints. You can implement this by examining the customer interactions for addressing problems of immediate impact. Updating the map: You would see fluctuations in the customer interactions. Adjustments and changes in one area will lead to changes in the customer interactions. Hence, you must review and assess customer journey map at every stage. It helps you to remain relevant, competitive and updated. Customer Point of View: A valid customer map must always include customer journey information based on recent research. It must capture goals, needs, expectations, personas, and experiences across the various touchpoints. Customer experience is the foundation of the customer journey map. You need to know what customers think, feel, and interact. Actionable and Purpose: Customer journey prepared using qualitative and quantitative research must contain purpose and have actionable elements. The customer journey map must define the customer goals, behavior and expectations by clearly identifying the positive and negative customer emotions throughout the customer journey. Multiple touchpoints: The most efficient way for the preparation of the customer journey map is merging the tactical and traditional customer journey maps. Traditional journey mapping is highly related to single customer experience, whereas, tactical map analyses customer experience from a single touchpoint. Merging these two types of customer journey maps will enable you to leverage it for future references. Performance Indicators: A generalized approach where visual indicators specify positive, negative or neutral experience. The visual indicators depict areas where expectations of customers are not met. Quantitative customer experience analysis can be used in the maps to enhance the reliability of the same. Highly Engaging: Multiple versions of the customer journey maps that inform and engage the target audience is the most effective and engaging. It must also provide the hindsight or behind the scenes view of the customer experience in each of the touchpoints. It helps gain clear visibility of the positive or negative customer experiences and further rectify them. Customer Behavior: An accurate CRM profile can help you understand the customer journey clearly. It explains with clarity how the customers got to know about your brand, how they reached out to you and so on. When you can identify the patterns in the demographics, you can shine in drawing your ideal customer persona. You can use CRM to find out the behaviors of existing customers. It mentions the target prospects and their viability. Lead scoring: Lead scoring means finding potential customers based on their profile and behavior. After drawing the picture of the ideal customer, you must match their profile with the leads. The pattern that matches with your previous leads or customers is called hot leads. Those who fall outside this category are irrelevant to your marketing campaign. With a standalone CRM system, you can evaluate your leads. Personalization: Apart from using CRM to track your clients, you must establish relationships with the hottest leads. It would help you take the right efforts to influence the potential leads to trust and try out the marketing hourglass. You must provide specific details for the hottest leads to remain as your customers. Marketing hourglass is the new marketing funnel that tracks the conversion of leads into customers. There are seven distinct stages. Email segmentation: Once you gain a customer, it is essential to retain them by providing personalized and value-adding services, discounts, referral programs, and other incentives. With CRM and email segmentation, you can provide the targeted prospects with value-driven (also customized) emails regularly. TechDataPark provides competitive and accurate CRM Users Email list to save your time and cost in b2b marketing. For more details on CRM B2b Users Mailing list, follow the link www.techdatapark.com. Automating marketing communications: You must integrate the email marketing platforms and CRM to increase visibility of your brand. It not only reduces the gap between the marketing and the sales department, but also encourages personalization and generates sales. By using the batch and blast methods, you can engage the leads in your business. To increase your email engagement and conversion, you must integrate email marketing and CRM. Brands are sending an unprecedented amount of emails to their customers on a daily basis; that’s 269 billion on an average. – The Radicati Group. Mapping customer journey: You must find how existing and potential customers find your products. To build a lifelong, profitable relationship, you must create an accurate and honest customer journey map. Finding gaps: You must see the customer gaps which show the difference of customer experience with an organization. To find the gap, the company must have an outside view of the customer journey map and subsequently align it with existing internal processes. Total customer view: You must design a complete customer view that provides the critical insights undertaken during the customer journey. Automated processes: A customer journey includes multiple touchpoints, internal systems, and channels. It is, therefore, necessary that the customer should apply a broader perspective when performing the journey mapping and email automation. It provides a consistent customer experience at all stages. Analyze and optimize: You should continuously ask your customers for feedbacks which can be further used to rectify and adapt the right customer journey, targeting the appropriate audience. “86% of senior-level marketers say that it’s absolutely critical or very important to create a cohesive customer journey.” (Salesforce). A passionate writer and a man of thoughts, Sebastian Coleman, share a great interest in the fields of data analysis and digital marketing. Sebastian was employed as a successful salesman; however, his love for writing and crafting content allowed him to change his career paths. Some of his hobbies include collecting stamps, listening to music and traveling to less popular destinations. Please leave your feedback below. Would you like to read more of such interesting articles?